. - Page 3 of 5 - . Morgan Freemans and another Ted seminar led me to Neurotheorlogy a new reasearch area. 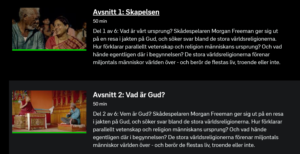 Swedish television share in svtplay.se the Morgan Freeman documentary the story of God cut into two pieces “1. “The creation” and “2. What is God?”. You are able to see the svtplay contents if you get a Swedish IP. You can ge one with an account in ovpn.se. I use it when I am in Italy. and this focused on life after death, the Egyptian, the Aztecs and the Mexican view about death.